Celebrating Marriage Equality: Woop! Woop! Tracy and Marge on Huffington Post! The U.S. Supreme Court 5-4 decision to recognize the right of everyone to marry who they love regardless of their gender was more personal than it might have been a few years ago. Since my involvement with CTI and the leadership program I have many more gay or lesbian people in my tribe. Marj Plumb (on right in photo above) was my executive coach for several years. I knew she was in a committed relationship with her love Tracy, but I was not so close to her that I knew they were married. But then when I moved to New Zealand we became facebook friends and I followed her posts as she and Tracy moved to Omaha, Nebraska for Tracy’s job. Suddenly their marriage was not legally recognized. They were named parties on the lawsuit against the State of Nebraska and ultimately their fate was in the hands of SCOTUS. 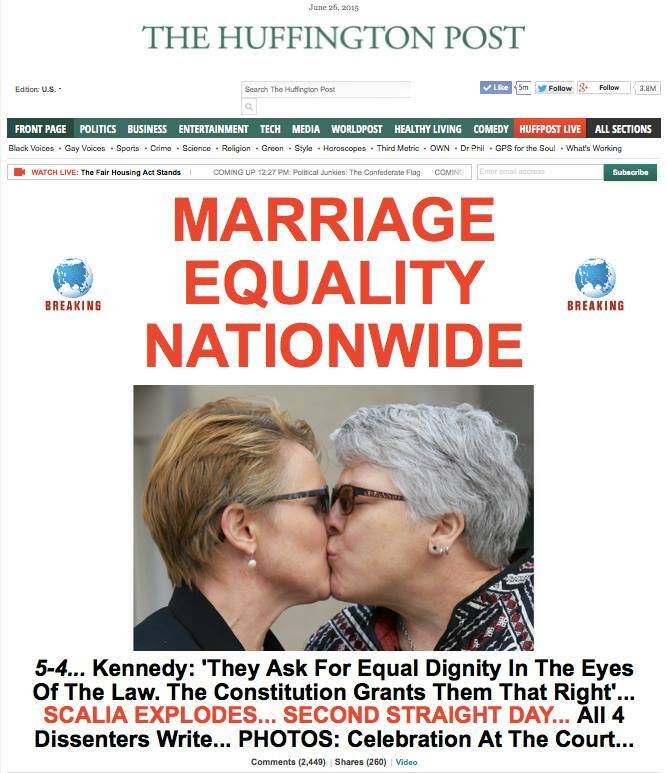 I was thrilled to see the Huffington Post celebrate them as they have been leaders on this issue. My own thinking on marriage rights had already evolved from conversations with my Panther tribe mates in CTI Co-Active Leadership program. It was such an intense experience and we grew to love and respect one another in a very deep way. One retreat we spent two evenings telling one another about a profound experience that has shaped us. Many of my tribe members shared the pain and rejection they experienced when they came out. This was the first time I knew someone well enough that I learned these intimate details. Panther Dale was politicized by the battle over California’s Proposition 8 at the end of 2008. He helped me understand that there was not a compromise that worked and why. I struggled with the arguments that I had heard at church and from conservative friends. Dale’s leadership–which included getting all of the men in the program to wear gay pride underwear!–impacted my thinking and by the end of 2010 I was ready to vote for marriage equality. Another Panther Jen and her partner Leslie also challenged my beliefs around my faith. They are committed to each other and committed to Christ. This challenged all of the teaching I had ever heard in the evangelical church. I began asking new questions and seeking the Holy Spirit’s guidance. Ultimately these perspectives and their leadership helped me make a shift to a new way of thinking. Of course this means that I am no longer comfortable in old places. I am not sad about this because my heart is bigger and I have a new perspective and there is no going back to the old way of thinking. It was with a full heart that I celebrated the Supreme Court’s decision. Woop! Woop! Next > Path into the Abyss or to the Summit?